Deiberto’s Mexican restaurant in Oceanside CA was destroyed by a fast-moving kitchen fire on Wednesday, October 9. Investigators have determined that the blaze began on a stovetop and quickly spread to the exhaust hood and then into the kitchen exhaust system. Although the restaurant sits opposite a fire station and fire crews were on the scene within 90 seconds, the damage was still extensive. This is typical of a kitchen exhaust system fire, which is fed by highly combustible grease caked on the inside of the exhaust hood and ductwork. According to Battalion Chief Pete Lawrence, two kitchen workers attempted to use a fire extinguisher to put out the blaze, but when the extinguisher malfunctioned they were forced to run out of the building. First responders to the scene encountered heavy black smoke and flames shooting out of the rooftop through the kitchen exhaust fan. The smoke was so bad that traffic had to be diverted from the street in front of the restaurant. Within 30 minutes, a crew of 38 firefighters were able to extinguish the fire. They remained on site for about four hours dousing hot spots and helping with efforts to salvage items from the building. The total damage caused by this fire is estimated at $350,000. Kitchen Exhaust Hood Scraping: Scraping accumulated grease from the kitchen exhaust hood can help prevent stovetop fires from spreading. This service is typically recommended monthly. Kitchen Exhaust System Cleaning: Grease also needs to be removed from the interior walls of the entire kitchen exhaust system. This is best accomplished using steam cleaning two to four times per year. Grease Filter Exchange: Grease filters must also be cleaned or replaced periodically to avoid the development of a fire hazard. Fire Extinguisher Testing: Simply having fire extinguishers on hand isn’t enough. The extinguishers need to be tested and refilled periodically, and employees should be trained in their deployment. Automatic Fire Suppression System Inspection: Employees may have mere seconds to react to a stovetop fire before it enters the exhaust system. 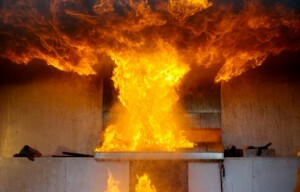 An automatic fire suppression system serves as an important failsafe to help prevent stovetop fires from spreading. These systems need to be inspected regularly and reset after every discharge. Had Deiberto’s kitchen exhaust hood and ductwork been clean, the fire could probably have been contained on the stovetop and would not have resulted in so much damage and disruption. 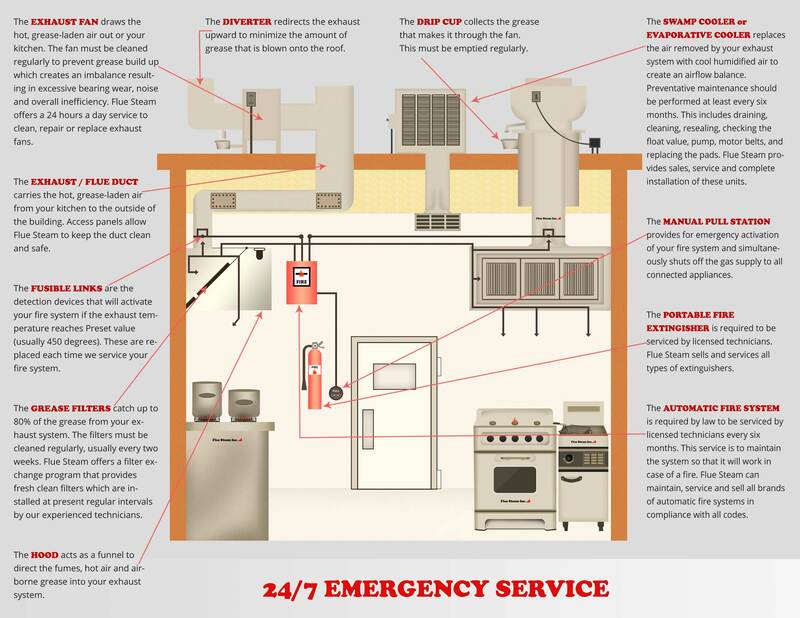 Restaurant owners would do well to be proactive about kitchen exhaust system cleaning and fire prevention. After all, it’s better to be safe than sorry. Flue Steam can provide all the services you need to reduce the risk of fire in your commercial kitchen.